A couple of kiwi chicks have left a lasting impression on a group of sailors on a mission to Turn the Tide on Plastics, as they sail around the world competing in the Volvo Ocean Race. 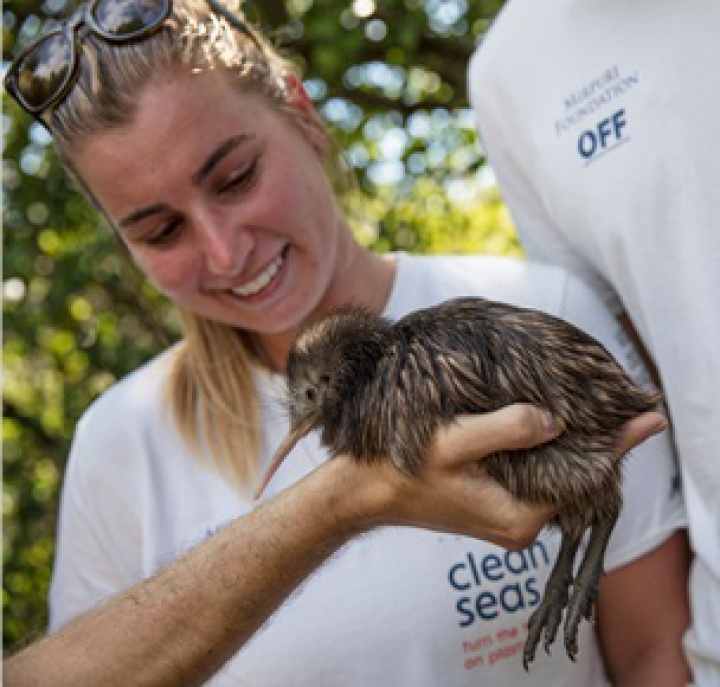 Turn the Tide on Plastics crew members Bianca Cook (a New Zealander), and her crew mates Bernardo Freitas and Lucas Chapman, spent a day on Motuora Island, a kiwi sanctuary crèche in Auckland’s Hauraki Gulf, assisting with the release of two, three-week old kiwis. The team were also given the chance to name one of the kiwi chicks, which weighed in at 447 grams on its release day. “It was an amazing experence, something that was very special to me and my team,” says Cook. “As most New Zealanders know we don’t often get the chance to even see a kiwi in the wild so having the opportunity to actually release one was incredible and very humbling. Auckland Tourism, Events and Economic Development (ATEED) General Manager Destination, Steve Armitage, says as New Zealand’s largest marine park, Hauraki Gulf is an important part of Auckland’s appeal as a place to visit. “We know we have a shared responsibility to protect and preserve Auckland as a destination, as a community, and as an economy for future generations. “ATEED puts kaitiakitanga or guardianship, at the core of what we do. That’s why working in partnerships with DOC, Kiwis for Kiwi, mana whenua, and organisations like Seacleaners and Sustainable Coastlines is so important for us. It helps to spread the word to our visitors and locals about how important preserving our natural environment is,” he says. The kiwis were released as part of Operation Nest Egg, a progamme managed by charity organisation Kiwis for kiwi, in partnership with the Department of Conservation (DOC). The programme involves collecting eggs from the wild, incubating and hatching them at facilities like Auckland Zoo, then transferring them to crèches like at Motuora Island, where they stay for a year or so until they are around 1 kg in weight and able to fend off most predators. They are then transferred back to where they were found as eggs, or are used to start new kiwi populations on pest free islands in the Gulf. Motuora Island is managed by the Department of Conservation(DOC) in partnership with Motuora Restoration Society. There are no rats, stoats, possums or other introduced predators on the island, making it safe for kiwi and other threatened native birds. “Everyone travelling to these island sanctuaries needs to make sure they’re not transporting any predators, pests or weed seeds on their boat, kayak, yacht or any other vessel. And we remind them that cats and dogs are not allowed on pest-free islands,” says DOC Auckland Inner Islands Operations Manager Keith Gell.